I seldom read non-fiction book, the least of all, self-help book. This one grabbed my attention because it's well-known book that I have heard so much about. 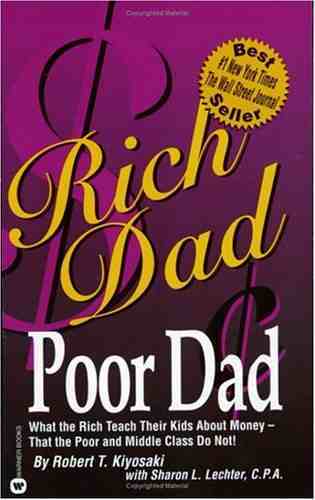 Rich Dad Poor Dad by Robert Kiyosaki is more of a self-help book than a financial one. The writing is easy to understand without hard-to-grasp financial concept. Basically, this book talked about financial intelligence and the importance of it for us to master it, rather than actually teaching you how to be rich/how to be a millionaire/how to make money. At times, the author seems to be repeating himself again and again about certain points. Is this how self-help book is? Anyway, I find some of the points useful. Also, the repetitious style may indirectly drumming those points into my head, helping me to remember it. Some of the points make sense to me. For example, Kiyosaki pointed out that when we earned more, we tend to spend more but not on things that can help generate income for us. We buy things that become liability to us (car, gadget) and not assets (property, shares) that help generate more income for us. Those liabilities ended up sucking more money out of us. This is why we are stuck in a never-ending life cycle of a salaried worker. No matter how hard or how much salary increased, money always seem not enough, true isn't it? It seems simple but think, how many of us, when upon receiving extra money, start to buy new phone/computer/car etc?